Take your workout to the next level with this exceptional value for money powerful pre-workout! In short, one of the most potent and best value pre workouts available today. 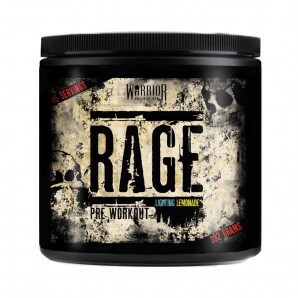 Warrior Rage is in our opinion one of the most potent and subsequently effective pre-workouts available in the UK. Furthermore, it is great value – each tub has 45 servings and is exceptional value per serving. Creatine – one of the most highly researched and proven ingredients which is known to increase physical performance in successive bursts of short terms, high intensity exercise. Are you ready to take your next workout to the next level? Get the edge over your friends and others at the gym, buy Warrior Rage today! Warrior Rage isn’t for the faint hearted, this is potent and will have a profound effect on your training! Add one tiny serving of Warrior Rage to around 250ml of cold water and shake in a shaker. Consume immediately after shaken and get ready to train 30 minutes later. Note that Warrior Rage contains a high amount of caffeine therefore we recommend not to use this in conjunction with other caffeine products. 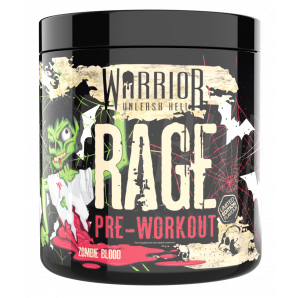 Due to the high caffeine content, Warrior Rage is only intended for use by healthy adults over the age of 18. Prior to consuming Warrior Rage we suggest that you seek advice from your GP or Pharmacist if you are unaware of your current health condition. Consult your GP or Pharmacist prior to use if you have or suspect that you may have any pre-existing medical condition including but not limited to: Low or high blood pressure, stoke, cardiac arrhythmia, liver, heart, kidney or thyroid disease, psychiatric disease, seizure disorder, diabetes, difficulty urinating due to prostate enlargement or if you are take anti-depressants (primarily Monoamine Oxidase Inhibitors MAOI) or any other medication. Discontinue use and consults your GP or pharmacist if you experience any adverse reaction to this product. Do not use if you are pregnant or planning to become pregnant or are breastfeeding. Store in a cool dry place. Keep out of reach of children. Do NOT exceed the recommended dose. Discontinue use or reduce dosage if you experience any adverse reactions. Use as part of a balanced & healthy lifestyle.